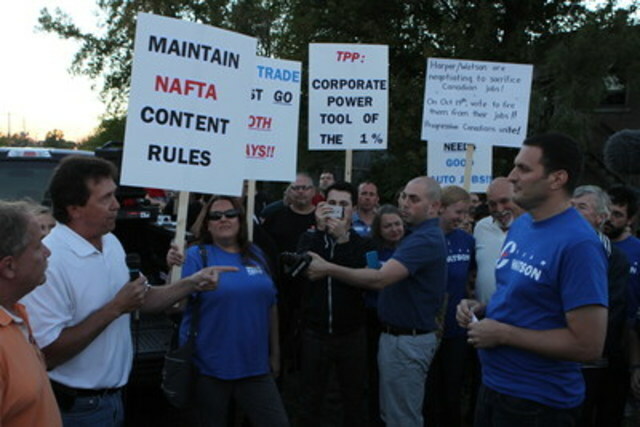 TORONTO, Sept. 24, 2015 /CNW/ - Unifor members, their families and supporters rallied outside the offices of Conservative election candidates last night, bringing them the realities of the Trans Pacific Partnership, mere minutes after the trade minister went on national TV to deceive Canadians about the threat. "Ed Fast needs to tell Canadians the truth about the threat posed by the secret deal he is negotiating," Unifor National President Jerry Dias said. "Instead, he goes on national television to promise everything will be great, even as Stephen Harper admits the TPP will be bad for the auto industry." Dias challenged Fast, Canada's trade minister, to a public debate on the TPP and its impact on Canadian jobs. In a CBC interview Monday evening, Fast said Canada needs the TPP to protect Canada's interests under NAFTA, and that the deal would help exports of Japanese-branded cars out of Canada. "Neither of those statements are true," Dias said. "Without the TPP, the NAFTA rules stay in place. And almost all of our Japanese-branded exports go to the US. That won't change with or without the TPP." Unifor Economist Jim Stanford has estimated that the TPP, as currently being negotiated to drastically lower the domestic content thresholds for auto parts, could threaten 26,400 jobs in Canada. Both auto parts and auto assembly jobs could be hurt, he said. "If anything, that number is rather conservative," said Stanford, who explains his methodology to calculate the job loss at progressive-economics.ca. "Before he goes to Atlanta next week to complete the TPP negotiations, Fast needs to be straight with Canadians about the threat, and to explain why Stephen Harper has said the auto industry will not be happy with this deal." In an open letter in August, the Auto Parts Manufacturers' Association also warned about jobs losses from the TPP. "A low RVC (regional value content) would seriously compromise our operations in the North American region, and we may be forced to significantly reduce our operations," the APMA said. To help ensure Fast's colleagues in the Conservative caucus know the facts about the TPP threat, hundreds of Unifor members and their supporters last night rallied outside the campaign offices of eight Conservative incumbents in ridings with a significant auto presence. Despite an open invitation to candidates to speak to the rallies, almost all were met with closed offices. In Oshawa, despite posted hours saying the office was open until 8pm, the doors were locked and the lights were off when the rally arrived just after 7pm. In Essex, incumbent Jeff Watson, a member of the Harper Government's auto council, launched into an attack on Unifor, but refused to say whether he would stand up for Canadian jobs under the TPP. Unifor is Canada's largest union in the private sector, representing more than 310,000 workers, including 40,000 in the auto sector. It was formed Labour Day weekend 2013 when the Canadian Auto Workers and the Communications, Energy and Paperworkers union merged. For more on Unifor's concerns with the TPP, go to unifor.org.